Hundreds attended Governor Palin’s book signing in Des Moines, Iowa today. There has been a lot of speculation about whether her two book tour stops in Iowa have political implications. Both the Washington Post and the New York Times reported on the event. Hundreds turned out for a Sarah Palin book signing in Iowa, an event the former Alaska governor and 2008 Republican vice presidential candidate insisted was not for political purposes. Palin’s stop Saturday at the Borders in West Des Moines brought her back to Iowa, which hosts the caucuses that kick off the presidential nominating season. The “American by Heart” author has hinted that she’s considering a 2012 presidential run, but says the visit was to promote her new book and that’s all. Security was tight, and Palin did no media interviews. People who bought her book were shuffled to the signing table in small groups. But few complained, and most couldn’t contain their excitement. The visit was, according to the official line, just a book signing — a chance for Sarah Palin to scrawl her prized signature for a few hundred fans on copies of her latest work. But against a backdrop of unceasing speculation about her future and coming after several recent interviews in which Ms. Palin acknowledged that, yes, she was thinking about running and, yes, she thought she could win, her return to a state that is expected to play a central role in determining the next Republican nominee for president took on — intentionally or not — a distinctly political flavor. The line of autograph seekers that snaked around the bookstore buzzed with the same two questions that trail Ms. Palin to all public appearances these days: would she and should she? Those expecting some additional clarity regarding her intentions, however, would leave disappointed. “Thank you for your encouragement,” she told her more enthusiastic supporters. If anything, the visit mostly offered a reminder that Ms. Palin sure knows how to draw a crowd, pulling in at least five times the number of people who turned out to the same Borders for an event last week for former House speaker Newt Gingrich. 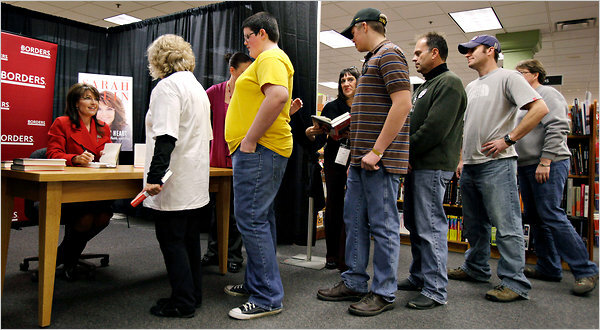 Those waiting in line ranged from curious fans (in addition to her two books, she is now a paid Fox News commentator, the star of a reality television program and the mother of a dancing star) to devoted political supporters (she was also governor of Alaska and the 2008 Republican nominee for vice president). This is her third visit to the state since the presidential campaign. The previous visits were last December for an earlier book tour and last September for a fund-raiser for the state Republican party. Ms. Palin will return to the state on Thursday at the end of her nine-day, 13-state book tour for an appearance in Spirit Lake. But after nearly three hours of signing more than 500 books Ms. Palin approached the stragglers in the store who had been told they had arrived too late. With a beaming smile she signed more books, posed for photos and urged the crowd to watch her show the next night. And she sidestepped a question from a reporter about when she would decide to run. “Oh my goodness!” she said. Over 1000 people attended Governor Palin’s book signing in Norfolk, Nebraska this morning. Many waited in the cold during the night and early morning for her arrival. With a quick thank you to everyone who stood in line waiting for her to arrive, Sarah Palin began her three-hour book signing appearance in Norfolk on Saturday morning. Saundra Biermann of Wisner was one of the first people in line at the Hastings book store in Norfolk. “It was worth the wait to see here,” she said. Mrs. Biermann — who was accompanied by her husband, Walter, and their grandson, Dennis Meyer III of Bellevue — said Mrs. Palin inquired about their names and asked how they celebrated Thanksgiving on Thursday. Prior to that, Mrs. Palin participated in a very brief welcome from Norfolk representatives, including state Sen. Mike Flood; Mayor Sue Fuchtman and Mike Long, chairman of the Madison County Republican Party. Also participating were Brook Kreder, director of the Madison County Convention and Visitors Bureau; Dennis Houston, president of the Norfolk Area Chamber of Commerce; and Rob Dover, also representing the Madison County Republicans. Sen. Flood said he was pleased Mrs. Palin chose Norfolk as a stop on her book tour. “It’s a great chance to showcase the community. We embody the heartland so it made sense for her to come here,” he said. Kreder said there’s no question that Mrs. Palin is used to media attention. “She’s very much a presence when she walks into a room,” she said. It was difficult to determine the number of people waiting in line to see Mrs. Palin. Early Saturday morning, the line was estimated at about 500 people, but that increased in size as the morning progressed, easily surpassing 1,000. Hastings representatives, along with book company officials, arranged for groups of people, generally of about 50-70 people, to enter the store at a time for an autograph before the next group was allowed in. The start of the book signing was welcome news for the Palin fans who braved the frigid nightime weather while standing in line waiting for the former presidential candidate and Alaska governor to appear. The Norfolk woman had arrived at the Hastings book store in Norfolk around 5 a.m. and was one of the first 100 or so people to get a ticket to see Palin. By 8 a.m., around 500 fellow Palin supporters or curiosity seekers had joined Walmsley. The line snaked along the front of the store around the west side and looped around a line of cars parked next to the store. Tickets to attend the signing began to be handed out at 7 a.m., and ticket holders had to be in place by 9 a.m.
“I agree with a lot of things she stands for,” said Walmsley, who sat bundled in coveralls and a blanket. Evelyn Velder of Norfolk echoed Walmsley’s evaluation of Palin. “She’s down to earth and real. Sort of like your next door neighbor,” she said as she clutched a copy of Palin’s book. Velder and her friend, Jeanne Loewe of Fremont, had arrived at the store at 5:30 a.m.
“She’s so beautiful. American women need someone like Sarah,” Loewe said. Haleigh Griffith of Norfolk was one of the youngest Palin supporters to spend the night in the cold in hopes of seeing the person who, some suggest, is responsible for instigating the “tea party” revolution in America. Twelve-year-old Haleigh isn’t as interested in revolutions as she is in seeing the star of “Sarah Palin’s Alaska,” the Palin family’s reality show that airs on TLC. “She’s so down to earth, young people can relate to her,” said Haleigh’s mother, Chris Griffith. Palin was expected to arrive in Norfolk by plane Saturday morning. But she actually flew in Friday night and stayed at Norfolk Lodge and Suites, a hotel representative said. Braving freezing temperatures, over 500 people showed up for Governor Palin’s book signing in Tulsa yesterday. Most of them voiced the hope that she will be running for President in 2012. It was Palin power Friday in Tulsa as hundreds of Sarah Palin fans showed up for a book signing by the political powerhouse. Many folks forget about the traditional early morning Black Friday shopping. The hot item on a cold day after Thanksgiving was wristbands limited to 500 people. It was their ticket to meet Sarah Palin as she promoted her new book during a stop at the Mardel store in Tulsa. “I’m just a huge Sarah Palin fan,” said Palin fan Kelly Waters. Waters was the first person in line, 24 hours ahead of time. She missed Palin’s last book signing in Oklahoma. “I was heck bent on getting my book signed this year,” Waters said. Waters wasn’t alone. A huge crowd, bundled in blankets and heavy coats lined up. “It’s worth it, because this lady will be the next President of the United States of America,” said another Palin fan Brian Roper. The bands allowed people to return later in the evening to meet the 2008 Republican presidential running mate. Trevor Siever, a Pryor resident, got the chance to talk to Palin. “Thank you. I hope you’re the next President,” Siever told her. “You’re the best fans. I love you,” Palin responded. Most of the fans hope Palin’s book tour sets the groundwork for a 2012 presidential bid. “She’s just like down home. Just like everyone else and she’s a great leader and a great inspiration to all women,” Siever said. But first things first. For now, they’re just happy to meet Palin, get an autograph, and thrilled to take away a memorable beginning to the holiday season. Sarah Palin brought her new book tour to Tulsa Friday, along with more speculation about a run for the white house. Her book, called: “America By Heart: Reflections on Faith Family and Flag.” More than 500 people lined up to meet the unofficial face of the Tea Party movement, and many say it was well worth the wait. Hogue and her daughters were joined by hundreds braving freezing temperatures. It was nice to make new friends, but there were really here to meet one person, Sarah Palin. With excitement and smiling faces, most said Palin was every bit as nice as they hoped she’d be. “She was so gracious, and very personable to you,” Lavonne Bynum’s mother Marcelle Bynum said. It was definitely cold while they waited… but the warm reception inside, more than made up for it. “Run Sarah, run in 2012,” Essex said. 2010 has seen so many stars-voters are lost for choice.ThePalingates/Krauthammers/Brooks/,the Crooks & Liars,The New York Times…and on and on. I won’t spoil your fun, you will all have your own favorites, and now is the chance for them to stand head and shoulders above their peers in the crazy stakes. Here are the PDS categories for 2010 with my personal nominations. You can of course also nominate the same ones, or ones of your own choice, and you don’t have to nominate in every category.